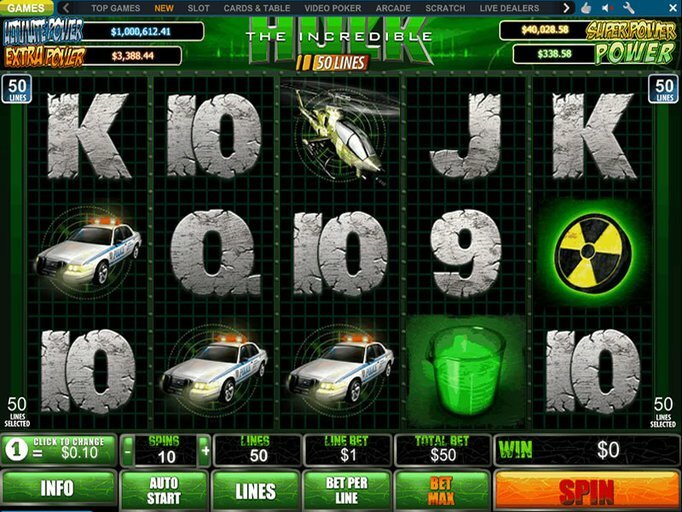 Anyone who is looking for a unique experience is sure to find the Incredible Hulk 50 Lines slot game to be absolutely perfect. As the name would suggest, this five-reel slot machine features a whopping 50 paylines to provide you with a ton of different ways to win. Of course, the theme is based on the popular Marvel-based character and you'll see him on the reels along with the Game Logo, police cars, radiation symbols and more. The machine has a top jackpot of $40,000 when the maximum wager of $500 is placed, though this can be customized quite a bit since the minimum is just a penny. It is part of the Marvel progressive network, too, so you'll be eligible for a tiered progressive prize no matter how large or small your wager. Simply use the buttons at the bottom of the screen or set up your parameters with the Autoplay function to get started. The Hulk himself is wild and he appears only on reels two, three and four. It expands when it is in the very middle of the screen or when it appears on all three central reels at once, and this means that there are plenty of opportunities to win big. The Game Logo is the scatter and three or more will give you 10 free spins during which all of your wins are tripled. Last, there's the Smash Bonus symbol which starts the second-screen bonus round if it shows up on reels one and five at the same time. During this round, you'll need to choose which cars on the screen to smash in order to reveal a cash prize. Then, you'll be able to smash one helicopter to determine your multiplier. During this feature, you might get the randomly-triggered 'Hulk Smash' which immediately smashes all seven cars for some seriously outrageous prizes. The good news is that you can get some Incredible Hulk 50 Lines free spins just to try it out over at Windows Casino. You don't have to make a deposit so there's absolutely no risk involved. However, if you win a prize, you'll need to meet some wagering requirements before you can withdraw it. They'll help you with this, too, since you can grab a 100% deposit match of up to $250 to help you on your way. Windows Casino offers this and many other Playtech titles from which you can choose, so you'll never get bored and there will always be plenty of ways to win.